How much longer can prices stay sticky. We are already starting to see some significant price drops, but when will the herd really move? You are a strong advocate of using leverage to buy rental properties. The interest is deductible on your rentals but what about your own home? Why not use the Smith Manoeuvre to make more money? "The Smith Manoeuvre is indeed a powerful strategy, but it's not for everyone. There are both investment risks and serious tax risks. Your returns could be insufficient, CRA could invalidate your application of the strategy, or you could wind up in a negative amortization scenario if your house value falls." Well if it does swing to $520k, that would be the lowest since April 2009. The Smith Manoeuvre is only relevant for those who already have taxable investments and a non-deductible mortgage on their personal residence. Nobody with any financial sense would get into such a situation in the first place. maybe someone has this already, but it would be great to have a median price chart like the vreb average price chart. Anyone? "It's remarkable how consistent the numbers are this year." From CBC: Should we stop encouraging home ownership? I think the Smith Manoeuvre can be a good way to go but you have to have sufficient equity in your primary residence to pull the funds out and invest them elsewhere. In my case, I sold one house and made quite a bit of money and bought a couple of homes with 20% down, turning each into a rental as I moved after two yearsish. I never stayed long enough to build back up the equity to the point of doing the SM. I chose places that would be cash flow positive as rentals if needed. The market right now will not likely lead to big equity gains on my new primary residence for the next couple of years. I do have rental income on this residence which mortgage interest can be deducted from based on floor space calcs. So, imo, the bottom line is that the SM is good if you have significant primary residence equity and can borrow to buy a second rental property and you don't want to move and get your equity out any other way. The interest on the home equity loan would then be tax deductible. Overall, the rental has to be cash flow positive and you have to want to hold seven to ten years to for it to make sense in this market imo. Rental income on a primary residence makes more sense in my situation. Also, most folks do seem to have a non-deductible mortgage on their primary residence Patriotz. Unless it is paid off or you have a suite or home business there are not too many ways around that. I agree that other investments can be managed for taxes through RRSPs (restrictive and eventually taxed when withdrawn) or TFSAs. Owing a business is helpful for tax planning purposes as well. Most media articles aren't discussing rising vs falling prices any more. They are discussing how bad the decline will be. I've posted this before, but here's an update. Ignore the other info on there. The green line is a rolling average of the monthly SFH medians (crosses). Smith Manoeuvre - The key question is where I can find an investment which is safe and with a return rate higher than mortgage rate? There is no such investment as far as I know. So Smith is just gambling. Thanks Leo - based on the most recent four medians and the rolling average line is due for a sharp drop next month if things continue on par. Also, most folks do seem to have a non-deductible mortgage on their primary residence Patriotz. No fooling. Did you read the other part of the sentence? Very few such people have taxable investments. The Smith Manoeuvre is to sell your taxable investments, pay off your existing mortgage, and then borrow to buy investments so that the mortgage becomes deductible. It is not simply to borrow against your house to make new investments. It is not necessary to have taxable investments first, although I suppose that increases the ROI, but just because you were losing money before. I think it can be good way to fund the down payment for a rental property that has a reasonable expectation of profit - which is hard to find in Victoria short-term. Your home equity can be invested and the tax deduction and some profits used to pay down the principal faster and readvanced to your HELOC and used for investment purposes. The non-deductible mortgage gets paid down faster. You'd have to be really sure that your ROI was going to be higher than the HELOC interest tax deduction to want to do this. 2091 Carrick has an accepted offer on it. Good for them, but I would have liked to have seen the inside. Outside looks a bit rough but I don't think the alley shared with the apartment is a big deal. Small building not directly across from the property, and no parking in the alley. Very nice general area. accepted offer on Carrick? Not showing up yet - will be interested to see what it sold for. Lots of walk by traffic there on the way to/from Carnarvon Park. Not showing up because I don't think it is entered into the system until conditions are removed? I tried to arrange a showing and that is how I know. OK - it certainly is a rare-sized rancher and really made my wife take notice. totoro - you are looking for another home? No.... well, maybe. But not here.... probably. We can buy a cash flow positive place with a suite in the Okanagan right now for less than half the price of something here. We are looking to purchase one last place in January. Our budget is limited at the moment until all the renos are finished. We DIY a lot (three trips to dump concrete this week - cost $50 instead of $450 quoted) but plumbing and electrical are left to the professionals. We were initially quoted $5000 to remove and dispose of materials for our reno... we spent $120 plus our time (4-5 hours). We are over on the electrical though. Measure once and don't move your dryer after it has been wired. Happily everything has been leased so we are on track to reduce our monthly cost of living to... yes... almost zero. Well, actually cash flow positive with zero housing cost when you add in our Okanagan rental. I'm not sure there is a better long-term investment than cash flow positive housing in the right market with the right mortgage unless you are willing to invest loads of time into understanding the financial markets. That takes a certain kind of focus that is not for everyone. Yes, it is all about me. I'm the cog stopping the drop that you are all waiting for. Luckily I'm on haitus now so the market should respond ASAP. Get ready to jump in. Canadian Mortgage Trends: Did the OSFI Kill the Smith Manoeuvre? Luckily I'm on haitus now so the market should respond ASAP. I'm glad I made it to macro. Apt. Love that chart - Totoro, you are a force. Received a call from CMHC today. They didn't require anymore info after the first two questions as their target was for people that were renting condominiums and not owner occupiers. It's impressive how resilient our market is to a crash in values. There are 853 houses and 811 condominiums for sale -just in the core districts alone. That is an impressive 7.5 and 7.1 months of inventory respectively. On average it now takes 53 days to sell a house and 71 days to sell a condominium. And yet prices have stayed around 2007 levels for many months now. Of course that is JUST the core districts. It's a different market once you get past Victoria General Hospital or Elk Lake. It's crazy out there. 19 months of inventory for condos and 13 months for houses in the Western Communities now. That is just nutty. Very very few re-sales of properties that have been purchased in the last half dozen years. Most sales are from vendors who have owned their properties more than a decade now. And it seems to be these sellers that are setting the price levels. There seems to be a lot of people that bought in the last few years that can not sell without taking a loss and they are forcing up the months of inventory. There needs to be an economic events to sends prices lower. People who do not need to sell will not sell in this market. Since people have jobs and can meet their payments, there are not alot of people desperate to sell at discounted prices. You will find some but most will just pull their listing and wait. Victoria has been stable for 5 years and will do the same for the next 5 years. lot of big projects that will support the economy... Naval, sewage. Government jobs will not dissapear. "There needs to be an economic events to sends prices lower." This is only true if you are referring to a quick drop. As real estate values erode those that can decrease their prices (people who have owned their homes for a long time) will. People that have bought in the previous 5-6 years that can not drop their prices will pull their houses off the market and sit while property values continue to sink. "Government jobs will not dissapear." Read the news. There is constant griping about government jobs. My girlfriend was trying to find a job last year. Many jobs had hundreds of applications. over the past 5 years that most other places saw"
Prices have nearly doubled here. Sure if you compare us to Vancouver, you are correct. But Vancouver is in for it's own type of pain. "Government jobs will not dissapear"
The government is using attrition to downsize over the coming years which is equal to 1000-1500 jobs per year. This is largely a result of an aging workforce that is on averge older than the provincial population as a whole. There needs to be an economic events to sends prices lower. You may have noticed the economic events happening in the past few years, most recently this July when 30 year mortgages were discontinued. Given that the real estate market is driven by credit availability, any restriction of credit is an important event. According to Mark Carney, the Canadian real estate market, as a whole, is 37% overvalued (house price to income ratio). Vancouver and Victoria are the two most overvalued cities in all of Canada, well in excess of 50%. The cities that are the most overvalued will (on average) correct the most. 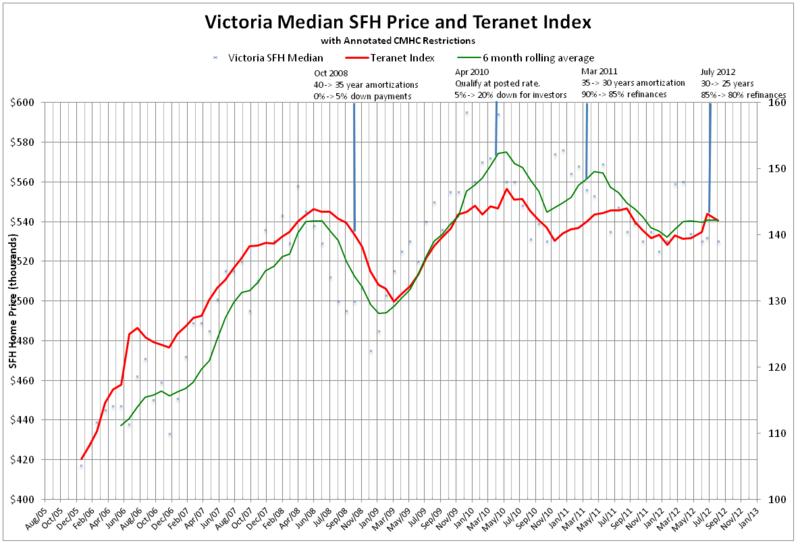 Houses in Victoria and area can already be had for 15-20% less than peak, and the correction/crash is only in its infancy. A significant correction/crash would have happened even without the (game changing) new mortgage rules. Those who did not buy at the peak of the bubble will be in a much better position to buy within a year or two. Kooz prices have done zero in the last 5 years in Victoria. May have doubled in the previous 5 years before 2007. I have friends who have found Gov jobs or contracts with ease in the past year. Maybe different right now with the freeze in hiring announced in Sept.
show me in history where prices fell without a recession or major economic event. If we go into a recession house prices are ^*&&*(. Maybe right. I am not sure that is a big enough event to send prices down. It does not force people to sell. It just keep those who should rent from buying. It is the buyers that set the selling price. All that is needed is a change in consumer sentiment ... and this is beginning to happen. Buyers need somebody to buy from. A seller needs to drop the price. We have seen this happen in forced sells but it seems that as a whole the median and mean is stable (off 5 to 10% from the top). Victoria does not have much of a speculative market like the major cities. So we have buyers who think the market should crash and sellers who will not lower their prices for the most part and just pull the listing. I think it ends in a stable market. The absolute guarantee about Victoria real estate is that the next five years will not be anything like the last five years. Yet, I can understand why those homeowners that live in the core areas of Victoria are unaware of the changes that are happening. The biggest reasons being denial and not understanding that real estate is a commodity that can fall in price as demand weakens. And that we live in a marketplace that is interconnected. If the difference between two adjoining neighborhoods becomes too great, then prices in one of the hoods has to adjust. Even condominium and house markets are connected. That's why you find new condominiums and starter homes around the same price level. A prospective buyer has a choice of where they want to spend their money. Most people do not wake up and say, I need to sell my house because house prices are not going up anymore. Most people own a home for not monetary reason. I cannot understand why all of sudden people who own homes in victoria are going to sell at 2004 or 2005 prices unless they are forced to. I just do not see that economic event that willl force a mass selling at huge discounts. Sellers maybe dreaming this but goodluck. Unemployment, demographics, credit, supply and demand determine house prices. Nobody has a friggen clue how it will all play out in the next 5 years. We all sit here and speculate. Like i said before. Read the the first few post on this blog from years ago. Same crap about falling prices back than. Actually, it’s the lowering of prices that will cause the economic event of recession. That’s how it happened, and continues happening, in a long list of countries. Vancouver sales and prices started collapsing even before the recent mortgage changes. Extreme overvaluations never require an event trigger to collapse on themselves. I’d say it’s a given they will be close to 50% off peak, 3 years from now. Yet even at 50% off, they will still be overvalued by many metrics. My hope is for most cities to experience a softer landing, like Victoria has been the last couple years. If we can continue falling only 7-8% per year, then hopefully foreclosures won’t escalate leaving taxpayers footing part of the bill. "Most people do not wake up and say, I need to sell my house because house prices are not going up anymore. Most people own a home for not monetary reason. " Why does anybody sell their house? This might be true for people that just want to upgrade. However, there are people that will need to sell. These are the people that will drive the prices down. If everybody can't sell houses for the prices they want, maybe we just won't have a housing market for a couple of years. The prudent rational thing to do would be to continue living in your overvalued house and pay down the mortgage as fast as you can at low interest rates. Good thing consumers are prudent and rational. Falling house prices may be the stimulus that pushes BC into a recession. Not the other way around. Consumer spending has kept BC from going belly up and that has a lot to do with the wealth affect of rising house prices along with easy access to credit and low interest rates. What we seem to be having right now is a demand-driven downturn. Or put it another way - we are running out of qualified buyers! The past government policies of easy credit kept prices up, by bringing demand forward. This robbed the rental market of tenants which caused our vacancy rates to rise significantly. Now we have a slow down in construction which is causing our unemployment rate to rise also. Now, we have less money flowing through our economy and far less sales happening. The slow down in the housing market is causing a contraction in our economy which will cause prices to fall. If your watching prices to determine how the market is doing, then you are going to be surprised when they do. You should be watching sales volumes, vacancy rates, and unemployment rates. Because prices are the last to change. Credit withdrawal from Subprime market and higher interest rates lead to foreclosures which sent the housing market down. 2 economic events lead to lower prices. Which lead into a recession which lead into lower prices. That is how it played out in most countries. So lower prices were not the cause but the result of the 2 economic events. Same thing would happen in Canada if interest rates went up and credit was withdrawn. Hap py, none of us have access to the inner workings of the government. I don't have lunch with Mark Carney and Jim Flaherty doesn't call me up to ask what he should do. The government for the last few years have had an agenda in stimulating the housing market. Firstly and most importantly was to get re-elected, then try to get us to spend our way out of an American style recession. That policy is over now. How do we know that? They keep telling you - it's over, that they are not going to add more stimulus, we Canadians owe too much. Now, that you know this. Where are you going to put your $100 bet on prices rising or falling? I know so many people who are priced out of the market because they though the market was overvalued in 2003 and sat there waiting for prices to fall. BTW most people do not have an interest in speculating on their house. But people are trying to sell as reflected in listing numbers at practically all-time highs for this time of year. "higher interest rates lead to foreclosures which sent the housing market down"
It was the falling prices in Spain, Ireland, and others that led to their higher interest rates. When the bond markets see that our bubble is finally bursting, investors will also demand a higher rate for the risk of lending us money. And it’s certainly a myth that we don’t have subprime borrowers. There are so many zero-downers who took out 30-40yr mort’s over the last 5 years. Sorry to dissagree. All they have said is we want those people who buy a house to be able to afford it. Banks are still lending. Interest rates are still low. People are still paying their mortgages. Listing number in victoria are the same as last year 4800. "I know so many people who are priced out of the market because they though the market was overvalued in 2003 and sat there waiting for prices to fall. " Did they continue to sit till today or did they bight the bullet and buy in above their affordability? And last year was also relatively record highs for listings. After holding on for so long, the bubble is finally starting to pop, and there may be another 25% to come off the market when it does. With the below comment where is that bubble bursting. More of the same stable prices in victoria. Funny think is I do not see a burst but would love it to get that place on the ocean on the cheap. Not willing to sell in advance though. I like the feeling of owning my own home. They ended up in condos or TH. Could not afford the SFH anymore. Depending on which way prices are going, you get the same homeowner saying that their house is their retirement plan OR when prices are going down -they don't care what happens to house prices as they own their home for non monetary reasons. But when you are paying $3,000 a month on a $600,000 mortgage and your home is worth less than $500,000 and falling in value - buddy you care - you care a lot. You stop maintaining the property or fixing those little things that break here and there. Instead of a new roof - you get it double shingled. A window breaks - you duct tape it. The lawn rarely gets cut and the old toilet that you replaced is still sitting by the side of the carport. Because, debt this high and at this low interest rate can NOT be paid down quickly. How much do you have to pay down your mortgage to lower your monthly mortgage payment by $400? And why do you want to pay off a debt at 3.99% when you have to keep a credit card balance at 18%. You would probably have better luck to go out and re-finance your home to the maximum and buy gold or stock in RIM. Then you might be able to sell the stock and pay off some of that Bear Mountain of debt. Hap - the market is shifting - if you have a PLS you can see it every day. the mass media is no longer really talking about whether a decrease in prices will occur but rather how big it will be. The market has not tipped here yet, but it is close. And when it does it will be from emotions moreso than anything else. I have owned houses, but I don't in falling markets when it is far cheaper to rent, buy the same house in 3-4 years and pocket the 30% difference. House ownership is not a speculative thing for me or most others. No one has said that people are not paying their mortgages. What I have said, is that fewer people are buying and it is getting more difficult to get financing than it has in the last several years. And it is those prospective buyers and sellers that set market values. The person sitting at home, paying their mortgage has ZERO influence on property values. CMHC has a cap of $600,000,000,000 in mortgage insurance. They are now over $576,000,000,000. They have to cut back in how much they can insure by somewhere in the range of half of the current loans. And most of that reduction will be in areas of over inflated housing, like Vancouver and Victoria. So, you can get a mortgage rate of 3.99 percent - but you will have a more difficult time getting mortgage insurance unless you come up with 20 percent down. That means fewer bidders for your property. And that means lower prices. The government caused your home to inflate in price - and the government is going to deflate that price too. In toronto average house prices fell from 276 to 192 from 1989 to 1995. People still took care of their houses. People still paid their mortgage. Life went on. The doom and gloom on here is just those that are positioned that way to profit from it. I doubt that anyone who really wanted to buy after 2003 where priced out of the market forever. Prices may have gone up, but interest rates fell, down payment requirements went to zero and amortization periods went to 40 years. So, I call BS on the statement that someone who could have bought in 2003 was priced out of the market. "So, you can get a mortgage rate of 3.99 percent - but you will have a more difficult time getting mortgage insurance unless you come up with 20 percent down. That means fewer bidders for your property. And that means lower prices"
Why? It may mean an actual stable market. I donot see Victoria`s numbers changing in Aug and Sept reflecting a crash. Same listings, prices and sales as last year. They were prices out at what they were looking at in the area they wanted. No they didn't Hap py. A look at the ML listings in Victoria from the last recession show that a lot of the homes needed substantial updating and renovations. Compare that to today's listings. Again Hap py, your looking at prices, not mounting inventory and rising days on market. Think of it this way. Your standing on a corner and your looking at the traffic coming at you. You see the bus hop the sidewalk and come at you- so you stand back. That would be looking at the months of inventory. Or you're standing on the corner and watching the traffic going away from you. And you get killed by the bus. That's looking at prices. Its been fun but off to my devaluing home. So Hap py, they were not "priced out of the market" they were just smart enough not to buy into the market. No they could not longer afford the house in the city they wanted. That area sfh went up quicker than their income. "Again Hap py, your looking at prices, not mounting inventory and rising days on market"
alot like 2011 and not just price. Nothing against the people you know - but if you were able to afford a home in 2003, you would have realized that the income to purchase price ratio combined with comparatively low interest rates made it an excellent time to buy. Many buyers over the past ten years have have been gambling on the resale value going higher. That's why they didn;t have any scruples about drawing down their "profit" on using a HELOC. If I planned to profit from my house, I would have sold it at the peak in 2010. My ongoing concern about mortgage debt is the effect that is has on disposable income (and thus the local economy), the lack of retirement planning (and fiscal solvency) of boomers, and the stress that money can put on relationships with family, friends and spouses. "They were just smart enough not to buy into the market." in 2003?? That's the funniest thing you have said yet JJ! Affordability is measured by the monthly mortgage payment in relation to income. And for Victoria that has remained stable to increasing. Someone buying the same home today in Victoria would probably be paying $500 more a month than someone who bought ten years ago when prices were far less than they are today. Your friends that live in those other cities may have had a different experience. But then prices could roll back in that city to 2003 levels and they could have an interest rate at 3.99% and they would be farther ahead than anyone who bought after 2003. It's not over - yet. I guess the listing expires Oct.31st! I agree. It sounds like someone is bitter they didn't buy into the market when they also had the chance. Hap - my last post sounded more speculative than I intended. I have never bought a home under speculative ambitions - always as a home. After selling my last home I thought that the market was due for a downturn, so we wait. Hap - I am sure if you are in your home for 8+ years you won't lose a cent and will have many years of happiness and memories in your home, as long as you are not overextended. If you are overextended, get out now. Ah - to buy in Victoria in 2003. The dream to never be realized again. But you don't need to then buy before an almost certain large drop. Someone buying the same home today in Victoria would probably be paying $500 more a month than someone who bought ten years ago when prices were far less than they are today. Actually, the price difference is much more dramatic than you suggest. In 2002, I purchased my house for $217K with 5% down. After fees, CHMC, etc. the mortgage amount of $210K works out to a monthly payment of $1185 (@ 4.75% interest) if I had opted for a 25-year amortization. The same house would now sell for $480K/ With 5% down and after fees, CHMC, etc. the $465 mortgage works out to a monthly payment of $2246 (@ 3.19% interest) with a 25-year amortization. So in 2012, the same house costs $1061 more per month! According to the BOC, the CPI has increased by 20% in the 10 years - so $1185 in 2002 dollars is $1422 in 2012 dollars - thus the inflation adjusted difference is $824/month. As others have commented, buyers in recent years have quieted their cognitive dissonance about buying property they could not afford by the promise of future appreciation. I don't want to treat real estate as an investment either. I want to buy a house that I can afford. I'm a professional developer that can not afford to buy an entry level house in Victoria. "buy a condo then or a town house" some might say "it will only go up in value. After a couple of years of building equity you can sell and buy a house". This is called speculating on a futures market. In the stock market it is highly regulated but in real estate it's a free for all. In the current declining market entry level buyers with small down payments become underwater very quickly and cannot break even when selling. With no buyers, inventory builds. The doom and gloom doesn't apply to people in your situation Hap. It applies to young families that will be in serious trouble very soon. People still took care of their houses. People still paid their mortgage. Life went on. Your arguments are way too general, so there is no way to refute them. Did "people" still pay their mortgage? Of course! Some people paid their mortgage, and some people did not. There is no point in arguing based on meaningless statements like this. Banks are still lending as you say, but they are more strict about it. That has an effect on the market. Interest rates are low as you say, but regulations are tighter. That has an effect on the market. Most people won't sell as you say, but some people must. That drives the market. I think we can conclude in general, that those people made a mistake. The fact is, there have always been people that complain about the market being overpriced. Even at the bottom in 2000. Those people were categorically wrong. But what does it have to do with the current situation? If we take a look at the average 5 year mortgage rate, average income, and average house price, current mortgage payments are about $2350/month, or 40% of the average pre-tax income. 10 years ago that number was about $1800 (real dollars) or 34% of pre-tax income, which was a local low for Victoria. What are some reasons a house may be a "Court ordered sale"? Bankruptcy, house seized by bank due to missed payments, house seized by municipality due to missed tax payments (?). Divorce is the biggest one. Court ordered sales happen when the parties don't agree on what will happen with the family home and a court has to order the sale and division of the proceeds. Proceeds of crime legislation is another. Totoro - you ever spend some time in law school? Mostly I just haul concrete. You didn't address the question, counsellor. The simplest answer why a property becomes a court ordered sale is that the owners have not been able to make their monthly payments. Another is that the bank will not renew the mortgage, because of unpaid real estate taxes or the bank is no longer operating in Canada and you can't get financing from another institution to pay the mortgage out to the first bank. Mostly because you owe more than the property is worth. Personally, I have never run across a court ordered sale just because of a divorce. I've had the person living in the home stop making payments and then the bank start procedures, then the bank would get conduct of sale and hire their own real estate agent. I just don't know who would have conduct of sale in just a divorce? Because it isn't the job of the court to hire agents and administer the offers. That is a substantial increase in the monthly mortgage payment from 10 years ago both in real and nominal dollars. Now, can you back engineer the problem to see what price the home would have to be with the same monthly payment as 10 years ago? Yes. It's essentially exactly the problem I was just thinking about last week and posted the graph for. The concept of the "affordable house". So ten years ago the average house costing $280,000 took 33% of the average income. Today, that ratio would buy you a $480,000 house (note that the graph is in 2010 dollars). Instead of holding the ratio to income steady, you could hold the mortgage payments steady, but I think that's less valid. As incomes increase you people should be able to afford more. Canada's housing market appears to be cooling across the board in the face of tighter mortgage rules that affect many firsttime buyers of modest means, a new analysis from the Conference Board shows. The think-tank's snapshot of resales for August shows a widespread decline in sales of existing homes, with 21 of 28 metropolitan markets registering a drop from July, and 16 of the markets showing a falloff of five per cent or more. Senior economist Robin Wiebe of the Conference Board said there was evidence of cooling in some markets - particularly Vancouver and Victoria - before the new rules went into effect July 9. But the new data shows the slowdown has spread to most markets. While sales and prices were only temporarily sidetracked by the previous announcements, only to recover a few months later, this might "be the one that broke the camel's back," Wiebe said. Ten years ago, the market was just heating up. When and where you purchased made a big difference as some neighbourhoods were increasing in value sooner than others. Buying at the beginning of the year was much cheaper than at the end. According to the BOC Inflation calculator, that $463K home in 2005 should cost $525K in 2012 dollars (13.30% inflation). 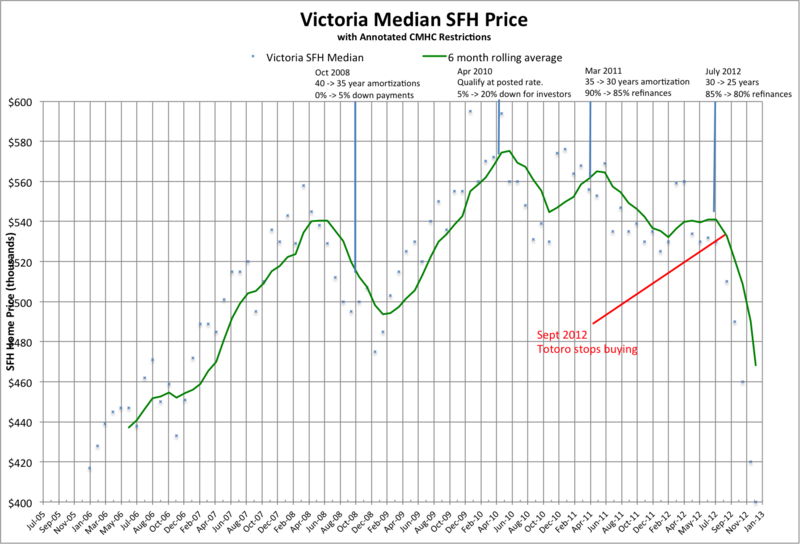 As the current SFH average is $618K, that would be a 15% correction for us to return to 2005 pricing. In previous real estate boom/bust cycles within the suburban core, western neighbourhoods such as Esquimalt, Vic West, and Saanich West has always been late to rise in value and among the first to drop. When the market drops, it takes longer for price reductions to "appear" in eastern neighbourhoods. I expect that this is mainly due to demographics and average incomes. Victoria and Vancouver are different. It could never happen here!!! Sell it again in 3 years for $200,000? That's what they said in California too. I know three house owners in California who all said it would never happen, but it did. The three families I know in California have collectively 'lost' over ~$$one million$$~ in the past 5 years due to house price deflation. There are many court ordered sales as a result of divorce. The bank or a third party does not have conduct of the sale unless one party refuses to comply. In that case, they go back to court for enforcement. These types of sales may not be advertised as court ordered. Relax leoM, everyone has been hearing the wolf cry for 5 years now, no one is rushing to the doors because of it. Just sit back and enjoy the show. HappyChucky said: In toronto average house prices fell from 276 to 192 from 1989 to 1995. People still took care of their houses. People still paid their mortgage. Life went on. I owned a house during that period in Toronto and life did not go on as normal. It was frightening. Look at results of Confederation Life and other business collapses. Individuals were under enormous stress and debt levels were nothing like they are today. In moving here I looked at SFH homes to purchase and I had a deja vu feeling from that period. I'm now a renter for the first time in years. I am not a doomer who wishes a bad market experience on others. But things don't add up right now so 'do nothing' is the best approach in my opinion. I also dropped my price level and started looking at townhouses, not because of affordability but because of diversification of risk. I really get a kick out of the viewpoint that renters and those who live in condos and twhs cannot afford a SFH. I probably held that view at some point too. I'm learning a lot as a renter and spending more time with my kids rather than on house maintenance. I have even started to wonder if I will ever own again. Maybe life has other plans for me and my money. Don't know but it's sure interesting to see how one's perspective can change in 6 months. price. Every one paid their taxes and condo fees. Homeowners may have been frightened but everyone still took care of their properties. That was my point. I personnally do not think we will see anything more than a further 10% drop. Even of we do. Life will go in Victoria. Most people lifestle will not change and they will still go out for dinner. In 10 years time. Home prices will be higher. I do not believe in speculating or timing home ownership. I am glad u like renting. Just as I would not lease a car, I do not want to rent. Home ownership is a personal factor for me and not financial. If home ownership was a financial factor I would not own a money sucking cottage. As the current SFH average is $618K..
Should we stop using the term SFH as so many people are renting out their basements, turning the SFH into DFH or even TFH's? Are there any stats on how many basement/secondary suites there are in Victoria? Last I heard 175 legal secondary suites, about 400 on file as non-conforming(neighbours complained; however, city is not doing anything about it unless large safety risk), and probably in the thousands as non-conforming not on file. Happy chucky - two words for why your viewpoint does not agree with my perspective on the 2012 reality - 'personal debt'. Personal debt only becomes a problem with a economic downturn (recession) or rising interest rates. I do not see either. Like I said yesterday. 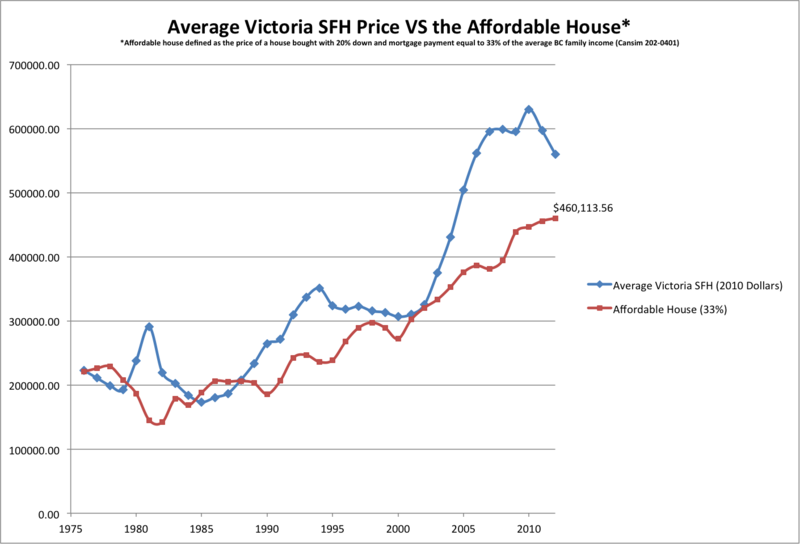 I have no issue owning a 400k to 800k sfh in victoria. I would have a problem owning a 700k 500sq condo in Toronto, especially if it is not built yet. I think anyone who cannot afford 25% down plus closing should rent. Just like our parents did. Owning a 1 million dollar house with a 900k mortgage is a fools game and those people deserve to have sleepless nights. Happy camper - I am experiencing the same as you renting - a lot more time and a lot better quality of life right now. Walk Willows Beach, the Uplands, Cattle Point daily. Volunteer in the community. Coach. Play games outdoors with my kids. hapy - I agree - if you don't have 25% down you need to save more and then buy. "Owning a 1 million dollar house with a 900k mortgage is a fools game" agree, unless you have the liquid assets to cover it and are just taking advantage of the low rates. 25%? Twenty percent gets you out of the CMHC fees for insurance. Why would you put the extra five in if you have rental income and a long term mortgage and you can afford everything as it is and it is a good property and time to buy? "Owning a 1 million dollar house with a 900k mortgage is a fools game" agree, unless you have the liquid assets to cover it and are just taking advantage of the low rates"
Very few people in Toronto are in that situation who have those kind of mortgages. I just love watching these HGTV shows where the people in toronto have 25k and the bank is lending them 400 to 500k. Makes me shake my head. These people should not buy a house. Fine... Just a number referring back to a time when people dealt in reality to what they could afford. Lower prices are a GOOD thing. Prospective buyers will then have less of their income going to the bank. That means more disposable income to spend in the community. And lower prices will have negligible impact on those that own a home. Even if prices were half of what they were at the peak, home owners will still make mortgage payments and buy groceries. The only change that I can see is that jobs that are associated with real estate will dwindle, but other businesses with do better. Just like gas, food, and cars. Lower house prices are better for the consumer and eventually for the economy. Because it is better for people and the economy to sell 20 homes a month at a lower price per unit, than just 10 at a high price. The only grumble I hear is from home owners who don't want to see new buyers getting a better deal than they got. But that's human nature, they just have to get over it. You paid your money - you took your chances. How true, you turn paper loss in to real loss, only when you sell. I am in now, and love my place, it will be my home for the next 20 years, it has everything I want, and it is in Victoria. Everyone told he I would never buy in town as it was too expensive. Yes the market may drop another 15% but I don't care, I am a very happy home owner. hapy - I am with you there - too many people I know in Oak Bay are way overextended and the stress is etched on their face. Totoro - yes, logically >20% is where you would want to be to avoid the insurance fees. I am old fashioned in that I like to pay off debts as fast as possible (with a significant buffer of 1 yr living expenses). axeman - may years of laughter fill your hallways. Congrats. Prices may not be falling but some folks are lowering their price. This one's off 27% from the original asking of $2.2 million, way back in 2011 or was it 2010. Bernanke declares war on Canadian economy, Winnipeg Free Press. good for you Happy Camper, you seem to realize what is important. In my case, buying made more sense, as my 2 teen age sons needed more room, and the rent of this house, would actually be more than my mortgage. C. You plan to live in for the next 10-20 years, cause its a crappy investment, you better love it. 2 years from now, will be a much better time to buy, but will your dream home have come and gone? Only you can decide what is right for you and your family. Who needs 6800 sq of living space in a 1916 house. Good luck with that one. Very logical. My view also. You can't buy a million dollar home with 90 percent CMHC financing anymore. CMHC won't insure the mortgage. And even 20 percent down, may not be enough for the banks to grant you a conventional mortgage too. You see and hear that in today's media, as the bank's economic advisers are warning about inflated markets like Vancouver and Victoria. My guess is that the bank's head offices in Toronto will be scrutinizing these jumbo loans and demanding the buyer put more skin in the game than just 20 percent. That will affect a lot of Vancouver and areas like Oak Bay. Like in Oak Bay where 60 percent of the properties that are currently marketed are over a million. Because most of the value of your home is not in the bricks, mortar and dirt but in the ability to get cheap financing and easy credit. Loose that ability - and bottom is a long way down. Can anyone recommend a great contractor? "Who needs 6800 sq of living space in a 1916 house?" The space is cool: plenty of room for that secondary suite. As for the vintage, you get stuff that you couldn't build for the price today -- if you could get build it today. Thing is though, it sold only ten or so years ago for $600,000. So Why's it worth more than two and a half times as much today? I think this illustrates why the top end is already in sharp decline. People paying millions for a house are mainly investing capital not using credit. To them, low mortgage rates are irrelevant. It's the real price that counts, and nothing has happened in the last dozen years to justify a doubling or more prices. My kids go to school and I work from home. We lose no time together when I do home maintenance. I also hate worrying about being asked to leave or not being able to paint or repair properly. I strongly agree that every family does have to make the home ownership/rent decision and where it is best based on financial and non-financial considerations. simple man, thank you, what price do you put on happiness, since my move, my family is happy, both kids love their new home, they both have a room and it is theirs, there is loads of laughter and a piano now rings joy everyday throught the house. I have a car port for my collector car, a spot for the BBQ in back, my neighbors are fantastic, we trade fruit and vegtables on a daily basis. I didn't pay full price, the market has been dropping for 2 years, and I didn't catch the bottom, that is 2 years away, and remains to be seen. But I don't regret the decision. to a certain point lower prices help people get in and stimulates construction. A dip is even one thing that stimulates a rally eventually. Perhaps this is why there is so much media effort to get the dip? I'll tell you this, if cash flow positive rentals start hitting the market in this town, I'll borrow from the MOB to buy em. "Perhaps this is why there is so much media effort to get the dip?" Media effort? Most of the advertising dollars for news papers comes from the real estate industry. It is not in the media's interesting to accentuate a dip. It sold for 600k, interested to know how old the renos are. The 600k may have been for a dump. My view is a 1916 house is going to give u problems. 6800 sq feet of maintaince and cleaning. No thanks. Awesome axeman - I am so glad you found something that works for you. Sounds like you made a good choice. Totoro - you are an astute woman and I am sure that you made a lot of correct choices along the way. I can absolutely understand that you can have quality of life while owning - just not when you are overextended, which by the sounds of it you are not. My comments were just to illustrate that you can be a renter, can be something other than living paycheque-to-paycheque and can be happy doing so. Yes, it would be nice to upgrade some things in our house and paint the interior to our colours, but in the end it does not really matter that much. Not as much as our health and our happiness. Since you watch Oak Bay so closely chances are our kids all go to the same school (Willows). Glad to have such a wise woman in my 'hood. Then Dasmo, ask yourself why, you get so upset with people who purport a 40 percent drop from the peak. It is NOT going to affect your living standard at all. And depending on when you bought, your circumstance would be a lot less than 40 percent. simple man, I have rented since moving here in 89, raised my kids in 4 rental properties. And benafitted from doing so. We saw friends raising kids in 2 BDR condo's and said, that wasn't for us, but they made it work. I was able to save a substantial down payment, as well as take trips, and have quality of life. Our rent of houses in Victora was much less than a mortgage, and we generally rented a room to international students to help out. Rents since this time in Victoria have ramped up considerably, we rented a fabulous house for $1450 and had 2 rooms as revenue, now that same house is $2000 plus. We were very happy renting all this time, while friends lived in their condos, with no back yard, no trampoline, no place to park the extra vehicle, no place for a garden. And no patio to BBQ and socialize. Oh ya, one room was bright orange, another dark purple, living room was dark grey... but we didn't care. After all, it was still a rental. My kids did go to Willows but they have moved to middle school now :) I went to Willows too. Good thing they did that earthquake upgrade! In the last two days there have been 90 new listings and 32 sales. Totoro - terrific - I have one in middle school as well. You are one of the blessed ones that grew up here in paradise. Good on you. Human nature is fairly predictable. Every time the media starts reporting how prices and sales are dropping in Victoria we get a bunch of new "happy owners" posting on this blog. axeman - if you were willing to rent out two rooms to students I agree that renting is extremely affordable for you. It works the same with owning too if you are willing to do this. I really think it is great you were able to build a down payment this way and enjoy where you lived. Those new listing are about the same as the last couple months 300 a week. 32 sales is not bad. It would be a boring blog made of up of only people calling for a 40%correction. "then Dasmo, ask yourself why, you get so upset with people who purport a 40 percent drop from the peak." I don't get upset, I get irritated by the lack of perception. It's fine to wish that but It's another to preach it to others who might make life decisions based on such foolish advice. Yes, the market is flat and falling, Yes, right now it,s a sound move to rent, Yes, prices might be lower tomorrow. However the stage is not set for a 40% drop in prices. hap pychucky - 32 sales and 90 new listings is bad news for sellers. (35% ratio) A balanced market is a 40-60% ratio. A sellers market is over 60%. We are definitely in a "buyers market" according to standard real estate industry definitions. That is why prices have been dropping for months - buyers are now forcing prices down. I’d say it’s a given they will be close to 50% off peak, 3 years from now. Yet even at 50% off, they will still be overvalued by many metrics. Yes, definitely a given. Since 2007, many similar projections have been made on this blog. Maybe those projections weren't characterized as "givens," but the majority of them were largely wrong nonetheless. At any rate, I have time on my side and I really like where I live. No, not necessarily. If forced to sell, I would care. If not, I wouldn't. The market always goes back up. Hence the cycles. There is an empty lot on Shelborne near the 7 eleven/starbucks/ Dominos in Saanich. That may be the only raw piece of land in Saanich, Victoria or Oakbay without subdividing or reclassification that is buildable. I could be wrong. "hap pychucky - 32 sales and 90 new listings is bad news for sellers. (35% ratio) A balanced market is a 40-60% ratio. A sellers market is over 60%. We are definitely in a "buyers market" according to standard real estate industry definitions. That is why prices have been dropping for months - buyers are now forcing prices down." 35% is where we were last Sept. Listings is 300 lower. Prices are the same. Ya I will give you this is a buyers market. Prices are still doing the same thing they have done since 2007. The average price has been between 575 and 650. In 10 years time. Home prices will be higher. I was kind of curious why you think so? When I look at the number of sellers about to surge up Mt. Retirement and then the potential buyers falling into the ravine next ten years, I have difficulty seeing prices higher. One thing for sure, it isn’t 1971 again. I wonder too, if last decade retirement buyers will now stay put in their home province near family, and instead opt to buy better weather places south at fraction of our prices? As long as Victoria has Population growth. They need a place to live and there is no more land. Our older population tends to stay in their houses. It will be too expensive for people to retire to the US 100%. They cannot get affordable medical insurance. I do not think it is reasonable to assume a ten year inflation of 35% (3% a year) and expect house prices to be lower also. Does anyone here jog/walk around the Dallas Rd. waterfront? Have you noticed the house being built just around the corner from Clover Point? They were going gung ho for the first six months and now (for the past six months), things are going at a snails pace. An older couple are having it built and they were excited in the beginning. The siding is truly ugly and I bet the neighbours are put off with the design as a whole. @alexandrahere - I run by there often and you are right - it was moving forward quickly and now seems to be slower, but there may be a lot going on inside. The siding is not that attractive to be sure and the house really sticks out among its neighbours. Alexandrahere, I like the design of that house actually. IT has personality, as gregarious as it is...I'm a little tired of ticky-tacky Faux craftsman. it's probably slowed because work transfers to the inside at a certain point. "But when you are paying $3,000 a month on a $600,000 mortgage and your home is worth less than $500,000 and falling in value - buddy you care - you care a lot." Well, the nearest we come to subdivisions of empty and partially finished homes is in Sooke. There are 42 new homes for sale in the village and none have sold in the last month. But then we are not 5 years into a housing collapse like the states either. As for the meter on your home. People are always curious what their home is worth and every year in January they are reminded by BC Assessment and once again in July at property tax time. I can't tell you that there will be a 40 percent correction in values. Because I don't know. It could be less or it could be more. Just like you couldn't guess when home prices would peak and for how much. Time has shown that the only people that were indeed wrong were the ones that thought prices would increase forever. And given the information available to people at that time, those that had the insight five years ago were not wrong. As it took hundreds of billion of dollars in mortgage guarantees to prop up the market temporarily. Now those prices are rolling back to pre 2007 price levels. Will that roll back continue? Most likely it will, until more people can buy homes again and sale volumes start to return to "normal" levels. It would take a monumental change for Jim Flaherty to switch gears and start to goose the market again. Now that he has turned CMHC over to OSFI and he is distancing himself and his political party from any downfall. Highly doubtful, that the cap of 600 billion in mortgage insurance will be raised. And since there is only 25 billion left before CMHC hits the cap, they will find it necessary to put the brakes on mortgage insurance especially in the high risk cities like ours. CMHC may spend the next decade reducing their level of mortgages they insure. And there has always been the rumor that the government will sell CMHC. Since the Crown corporation will not being added money to the government coffers for a very long time it might actually happen this time. There is simply no need for a government to be in the insurance business anyway. If I owned a house would I sell? There are so many variables, that it would depend a lot on how much of a mortgage I had. A couple of months ago, I could have pulled close to all of the value out of the home in a HELOC and invested it in Apple stock or gold. And I would likely be farther ahead today. So what are you doing with the equity in your home? Are you just going to passively watch it disappear over the next few years? Leaving you just a story to tell your grand children of how much it was worth at one time? Or are you going to double up on your payments to burn down that mortgage? And hope that you can pay down the mortgage faster than you loose equity. Which is the reverse of what happened to buyers on the way up as prices rose faster than incomes. At least your reading other people's views. And that's a good thing as you are more of an active participant than most home owners will be. The real estate game is over and the cheerleaders are starting to pack up too. "axeman - if you were willing to rent out two rooms to students I agree that renting is extremely affordable for you. It works the same with owning too if you are willing to do this. " Totoro, yes our new house has a guest room besides the 3 that we use, and a spare bathroom (actually 2) we will be renting out the room soon. This helps with the mortgage, but dose'nt consume a large chunk of the house. the basement will be used as a music room as my teenagers are both in band, and play piano guitar and drums. "If that is true why bother to post here - why not just enjoy their home and forget about state of real estate?" Because my opinion is just as valid as yours... some people actually see some value in my opinion. you obviously don't. "Totoro, yes our new house has a guest room besides the 3 that we use, and a spare bathroom (actually 2) we will be renting out the room soon. This helps with the mortgage, but dose'nt consume a large chunk of the house. the basement will be used as a music room as my teenagers are both in band, and play piano guitar and drums." Great plan. We have kids that play guitar and drums too. We ended up getting the electric drums that have headphones - very good decision. Also, I like to hear different perspectives. People have a tendency to find information that confirms their beliefs. It is easy to miss critical facts that doesn't fit your belief system if you don't expose yourself. Part of what drives a consumer market are attitudes that might be different from your own. Different perspective make me make better decisions. Nice thing about a "soft" market is that there is a lot more to choose from and some are properties that rarely come on the market. Some are really tempting to buy. There is just so much choice. And that is a lot different than at anytime over the previous decade. Back then, there wasn't much selection and you had to pay the Vendor's price. The problem with too much selection is that I don't know what I want anymore. Do I really want a big yard or a yard at all? A condo with a view? A character conversion? In the country? New or near new? That seems to happen to me, about every 10 years. What I want in a home changes. At one time I wanted a character home - now I have no desire to own an energy hog. Condos are a bit sketchy, unless the strata council has had a depreciation analysis done and how much they will raise the strata fees has been decided. Will it be in Victoria City. Not to confident in how the city will be able to contain the property tax increases when they have huge salaries for too many managers and spend excessive amounts on policing. And a 200 foot long bridge will cost more than buying all of James Island. Maybe they will just raise parking meter rates to a buck a minute. Again Dasmo, we are not into a five year correction. I wonder how many scams there will be as a result of the almost mandatory deprecation analysis' of most condos. The scenarios are many. We are 5 years into our correction. If you look at Leo's median graph you can see the brakes started pumping Aug 2007. Since then we have been in a seesaw pattern that I suspect in another 3-5 years will average out to a flat line at around the 2007 mark. Dasmo, every city has tear-downs. The good thing about all this increase in prices has been that the property flippers have been able to improve a good amount of the old stock of housing. We still have half million dollar and more homes in Victoria and Oak Bay with patched and tarped roofs, rotting siding, and subsiding foundations. There just filled with pensioners who can't afford to fix them or turn on the heat to keep themselves warm. Dasmo - when I read Leo's graph I see the median peak at the spring of 2010 when looking at the 6-month rolling average line. That's OK, keep seeing older homes needing upkeep and unsold houses happily rented or being lived in as the same thing as huge unfinished rotting subdivisions in the middle of the desert. I've read a couple of those depreciation schedules now, and I don't know about how truly useful they can be. Like the leaky condominiums, sometimes the repairs seem exorbitant. But then,when you ask a structural engineer on what you should do, your going to almost certainly always get the "Cadillac" solution. You're essentially attempting to guestimate what will need replacing in the future and what it will cost to repair sometime in the future. Then decide how much of a reserve fund you will need, assuming that the fund will earn so much income annually. Everything is a best guess scenario. I thought a better way would have been to allow Strata Corporations to qualify and obtain financing using a special monthly assessment on the suites for any large structural expenditures which could be amortized over the physical life of the building component being replaced. The Strata Council would then be allowed to assign a portion of the monthly assessments over to the lender each month. What that means is that the suites doesn't have to come up with $20,000 each for a new roof. Instead their assessment will go up by $50 a month for the next 15 years. Or whatever it works out to be. If you look at Leo's median graph you can see the brakes started pumping Aug 2007. If someone were pumping the brake in 2007, they also had their foot on the gas! Leo's chart show that prices peaked in 2010. Resale prices on properties in my neighbourhood peaked at that time, dropping 6% by 2011 and an estimated 8% since then. Should we stop using the term SFH as so many people are renting out their basements, turning the SFH into DFH or even TFH's? We don't have a dessert. Besides the pictures looked more like Detroit and we do have a Windsor. If you take a drive out to Sooke, you will see new subdivisions with very little building going on and lots of empty building sites. Unlikely we could get whole ghost towns so close to Victoria. We just don't build on the scale that the Yanks do. But then again, Victoria City is a small town by American standards about the size of Bellingham. And we all know how everyone wants to live there too. True, Simple. I was looking at the Teranet line. My feeling in 2007 was the tides had turned so I just keyed into the fact that their index shows the same thing. Well if property values are to flat line around the 2007 levels, someone should inform the outlying areas of our CMA, there already back into 2006 pricing. And some parts of the Gulf Islands are back into 2005. There are a lot of leaks showing up in this Dam. interesting, do you have numbers? Last I heard, of the estimated 9,000 illegal suites in Saanich, only 18 homeowners have elected to legalize their suite. That's quite a lot of interest! axeman said "but will your dream home have come and gone". Good grief, there's always another dream home. Our range is single family homes under about $550,000. No danger of dream homes there! At best there are workable options. My graphs feel so violated today! You bring up an interesting point though. I am a big fan of the concept of affordability because I see a much more logical pattern in monthly payments than in house prices in the last 30 years. A decline of the average to $380,000 would indicate a drop below what one would assume based on affordability. I don't think this is impossible, but it will take a strong decline in order to first "tip" a significant number of people into foreclosure. Seattle saw this scenario. 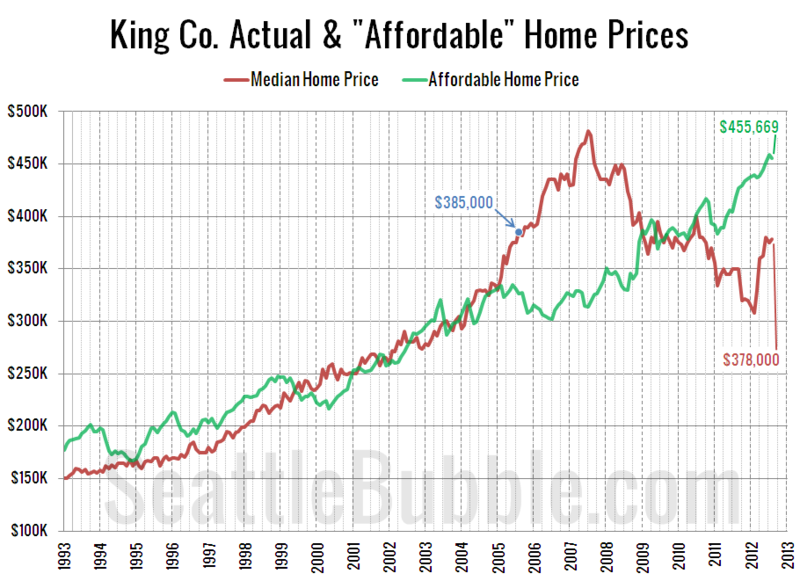 Notice how prices there actually corrected to 30% below what one would expect based on what local incomes could afford. However it first corrected by 20% before triggering further declines. If incomes do not keep up with that inflation, it's not only reasonable, but virtually inevitable. Just Jack: I agree with your assessment. If you have a property manager such as Brown Bros, Proline etc., they essentially are doing just that. At each annual general meeting they produce a report listing items that will have to be addressed in future years such as in all probably the roof will need to be replaced in 15 yrs, the carport roof in 10 yrs, new carpeting in the hallways in 8 yrs, and so on and so on and the estimated costs are pro-rated and each strata unit pays their portion each month so hopefully when an item needs to be replaced, there will be enough in the contingency fund to purchase the item or to do the necessary work. The almost mandatory depreciation report is going to force stratas that currently run themselves i.e. without property managers into hiring a manager because they won't have the knowledge and experience to wade through all the details of the depreciation reports. The stratas already having property managers will have a much easier job and of course they will be expecting the same management fees. What these reports will do, I think, is it will make it much more difficult for younger first time buyers to purchase a condo, especially an older condo because of the extra strata fees going for the exorbitant costs of the on going depreciation reports. I believe they must be done every three years or so. Thus, realtors will guide buyers into buying new condos because it will be many years before they will require upgrades, new fittings etc. I guarantee you that Brown Bros will do no such thing. Each property manager has at least 20 residential buildings plus additional commercial buildings to look after. They need the strata council to be very specific about what they need, set deadlines, and remind frequently to get even the simplest thing accomplished. The only thing they ever did for us properly was go after the people who failed to pay strata fees. Anyone who needs a manager who doesn't have one will do very well by hiring a smaller company. It all depends on how you measure it. If you look at annual averages, then the peak was definitely 2010. If you look at it more holistically on a monthly level, then you could argue that 2008 was essentially the peak followed by an approximately equal height camel hump in 2010. My monthly medians graph is adjusted to fit the data. Really the difference between the peak in 2008 and the second peak is only $20-$40k, depending on what exactly you're measuring. Teranet shows even less difference. It's a bit of an oddball case though because the previous peaks did not have the extraordinary stimulus which led to a quick revival and a second peak. Stats always depend on how you look at them I agree. This is why i added my highlight to illustrate my feeling. (sorry for butchering your fine work). I Sold my parents place in 2007 after buying my place in 2003 and avidly watching the mayhem ensue. This was partly because I was trying to convince all my friends that this was a window that opens once in a lifetime. Even then there was a lot of debate. Case in point, not all my friends bought. Anyway this lead to me pay attention to the market for probably 2 or so years until I lost interest. Then came selling my parents place. Well, it was already different. The media was still Rah Rah Rah, stats were still going up but the reality was different. Sales were no longer within a week at 10% over ask but were now 30 days min 5-10% under ask. We didn't get a lot of activity on the place but it sold for what I think was a fair value. We didn't over price it that's for sure. I don't think the peaks are as relevant as the trends. I think my hack of your graph illustrates that the trend is that the slow down really started in 2007, the peaks and valleys are natural as the market isn't full of a monochromatic product. But the trend is certainly a plateau. The last time in early 2000 that houses became so affordable wasn't because prices dropped, it was because no one cared, prices were flat, inflation went on and interest rates dropped. I think a similar thing will happen this time around. Yes, I think interest rates could drop even more. IT CAN HAPPEN HERE!!!! I like that highlight. Interesting way of looking at it for sure. If this market is going to drop, it has to start in the next year. If it's still bouncing around these levels next summer then there is no drop coming at all. Yes, I think interest rates could drop even more. IT CAN HAPPEN HERE!!!! One and a half years to my mortgage renewal...I hope you're right, dasmo! I find myself in the strange position of cheering on: another recession, American QE3, another American recession, collapse of Europe. Was poking around the Tectoria website and found this video. I'm envisioning what might be said on Edmonton's promotional video: "You'll probably make some money here, and minus 30 doesn't feel that cold if you wear proper clothing, and we have a mall, and our highest homocide rate in Canada in 2011 was just an anomaly, and you're only a two-hour flight to Victoria..."
I agree. Awesome sunrise over Cattle Point this morning with Mt Baker glowing in the morning light. Can you tell this to my wife? Yes, you are 100% correct, there are lots of dream homes in Victoria. Had probably my last after work bike ride, until spring, last night. Very enjoyable along Dallas Road and up into the Uplands and onto UVIC. Very quiet with very little traffic. Not looking forward to bringing out the rain gear and hope that we will have a week or two more of warm sunshine. I find it funny that they mention short commute times in that video when the point of the video is to get more people to move here...which if they all commute will surely increase commute times for everyone. Lots of price drops in the past few days. The leaves are falling in Oak Bay. Twice the sunshine & wages, half the housing costs & taxes. Why else would all our youth with dreams are headed there? In the Alberta video, comments are invited. In the Victoria video, comments are closed. As for spray foam insulation, you could call City Green Solutions. And inquire about any grants that are available. They will likely have to cut 4 to 6 inch circular holes in your exterior stucco or cladding to pump the foam into the walls as well as spraying the attic. I have heard only good things about the results. Maybe to spot the stupid comments that people always post that have nothing to do with the topic. There are a few on the Edmonton about oil/ tar sands.